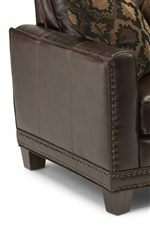 The Latitudes - Port Royal Transitional Loveseat with Nailhead Border and Wood Feet by Flexsteel at Jordan's Home Furnishings in the New Minas, Halifax, and Canning, Nova Scotia area. Product availability may vary. Contact us for the most current availability on this product.